Eric Eggert G e r m a n y 2 0 1 3 – t o d a y : W 3 C / W A I 2 0 1 6 – t o d a y : K n o w b i l i t y T r a n s l a H n g W C A G t o H u m a n .
If you can use a naDve HTML5 element or aJribute with the semanDcs and behaviour you require already built in, instead of re-purposing an element and adding an ARIA role, state or property to make it accessible , then do so. Do not change naDve semanDcs, unless you really have to . All interacDve ARIA controls must be usable with the keyboard. Example: I f using role=button the element must be able to receive focus and a user must be able to activate the action associated with the element using both the enter (on WIN OS) or return (MAC OS) and the space key. Do not use role="presentaDon" or aria-hidden="true" on a visible focusable element . All interacDve elements must have an accessible name. HTML5 input type="date" The input element with a type a]ribute whose value is "date" represents a control for secng the element’s value to a string represenHng a date. 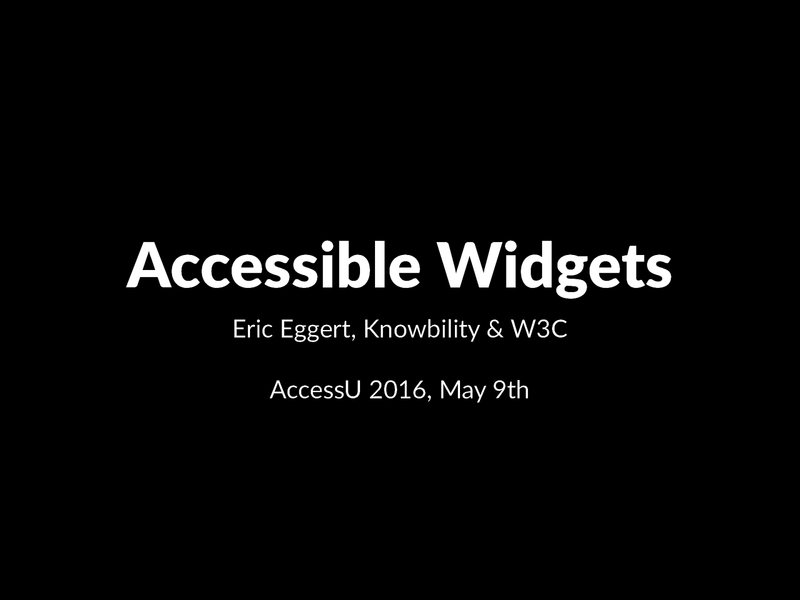 View Accessible Widgets 1/4 (Class).